Almost any woman will tell you that shoes are one of her favorite wardrobe items. The right pair of shoes can have the effect of transforming an outfit from somewhat stylish to absolutely incredible. Best of all, shoes always fit perfectly and certain favorite pairs seem to have an almost magical ability to make you feel like a million bucks. Unfortunately, both limited funds and a finite amount of closet space tend to keep most of us from having the abundance of shoes that we often wish for. Whether you long for shoes that will match every outfit you own or you simply pine for greater variety, there’s a simple and inexpensive solution that is quickly gaining popularity among women everywhere. Shoe clips are like jewelry for your shoes. Shoe clips are not a new addition to the fashion world, but they are making a huge comeback. Just as you might add a unique necklace or the perfect pair of earrings to complete your outfit, shoe clips are like jewelry for your shoes. They allow you to express your creativity and wear something that is uniquely you. They can even give your look that fashion-forward edge of wearing something that no one else has! Fashionable and versatile shoe accessories like clips allow you to create a wide variety of new looks using shoes that you already own. 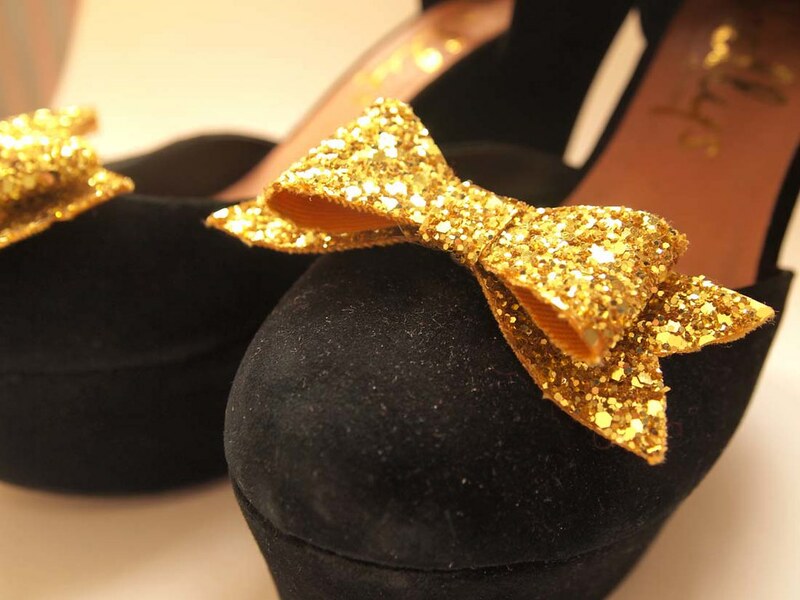 Shoe clips come in every style imaginable, from fun and casual to glitzy and glamorous. These accessories are often clipped to the toes of a shoe. However, they can be added almost anywhere including the backs, sides and even to the straps of your favorite sandals or dressy heels. Even sneakers can be transformed by adding decorative shoe clips. Every type of shoe from your slip-on ballet flats to your strappy designer stilettos can undergo a stunning transformation with an investment of just a few dollars. Because these beautiful accessories are merely clipped on, your shoes are not damaged or permanently altered in any way. Special occasions and formal events often mean shopping for dresses, shoes and accessories that most of us have little (if any) use for once the big event is over. From weddings and proms to cocktail parties and fundraising galas, each and every event seems to call for a different pair of shoes that are not only formal, but unique as well. After all, the mere thought of showing up to one of these events wearing the exact same shoes as someone else is enough to make a girl cringe! Brides and members of a wedding party have few options to choose from when they want to keep their look traditional, yet avoid the boredom and redundancy of having shoes that are just like those we’ve seen in countless other weddings. Designed specifically for just such occasions, bridal shoe clips are tailor-made to give the bride the stylish and original shoes that are unlike any others and will complement her special gown. Other designs cater to both bridesmaids and brides, and these wedding shoe clips can create continuity among the bridal party while still giving everyone a fabulous and original look all their own. Everyone has their own style and the clothing and shoes we choose to wear are one of the primary ways in which we express ourselves each and every day. Many vintage shoe clips have a classic appeal. Others offer some of the most interesting and unique designs with which to dress up your favorite shoes and express your own unique personality! From shoe clips with rhinestones that are reminiscent of your favorite grandmother’s brooches to clips that feature feathers and lace, few accessories can lend such a simple yet authentic vintage flair to your modern wardrobe. Rhinestone shoe clips are one of the most popular varieties available. There’s no easier way to add a bit of sparkle and glam to that little black dress than with beautiful shoe clips that will sparkle as you walk across a room. For a subtle sheen and a more classic look, shoe clips with pearls are a lovely and understated option. With the simple addition of elegant pearl shoe clips, you’ll look flawlessly put-together from your favorite pearl earrings and necklace all the way down to the matching pearls at your toes. Shoe clips with bows are one of the most popular and prevalent designs available. 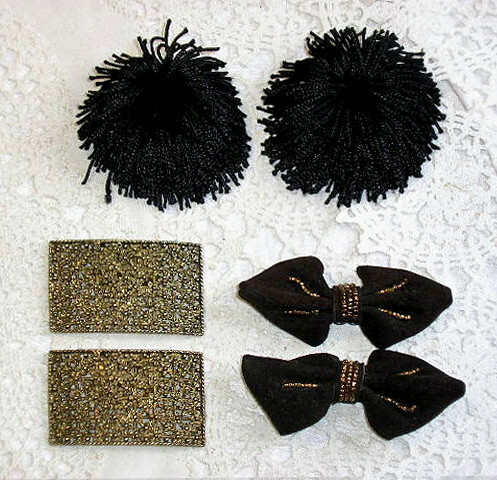 Bow clips are casual and cute, with a vast array of textures and patterns to choose from. They also come in all shapes, sizes and colors. One of the most appealing features of bow shoe clips is their versatility of wear as they can doll up any type of shoe from sneakers and Mary Janes to strappy sandals and sophisticated pumps. Another charming way to use this particular type of shoe clip design is by creating matching bows in differing sizes. By doing this, moms and daughters of all ages can wear shoes that are original, coordinated, creative and adorable. From elegant pearls to flamboyant peacock shoe clips, there’s no shortage of trendy looks and unique styles out there to choose from. Of course, sometimes ready-made products simply won’t do and the only way to create the truly unique shoe clips you envision is to create them yourself. 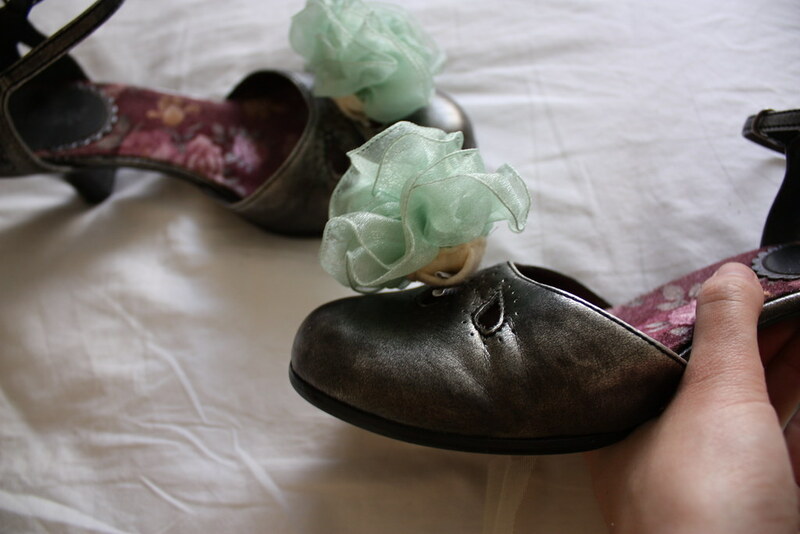 Shoe clips can make a great craft project! They’re simple enough for a wide range of age groups and you can create a work of wearable art that truly expresses who you are. Learning how to make shoe clips is incredible easy and there are plenty of step-by-step instructions out there to help you get started, from simple DIY bows to vintage DIY clips. Best of all, you’ll only need a few basic craft supplies in addition to whatever style elements you wish to add. If you prefer to let professionals take the reins, there are some truly exquisite designs available from some major retailers. J. Crew, for example, offers a line of fabulous shoe clips from jewelry designer Lisa Salzer of Lulu Frost. Other popular brands include Eric Giuliani, Brydferth and Absolutely Audrey. Whether you choose to purchase designer shoe clips or make your own, this is one fashion trend that is well worth embracing. By embellishing your favorite footwear with decorative clips, you will save money while adding a variety of fresh new styles to your wardrobe. Shoe clips allow you to express your own unique personal style in a way that is simple, fast and fun. Next articleShoe Bags and How to Choose the Right Ones!